Our homes offer the luxuries you want and the conveniences you expect. 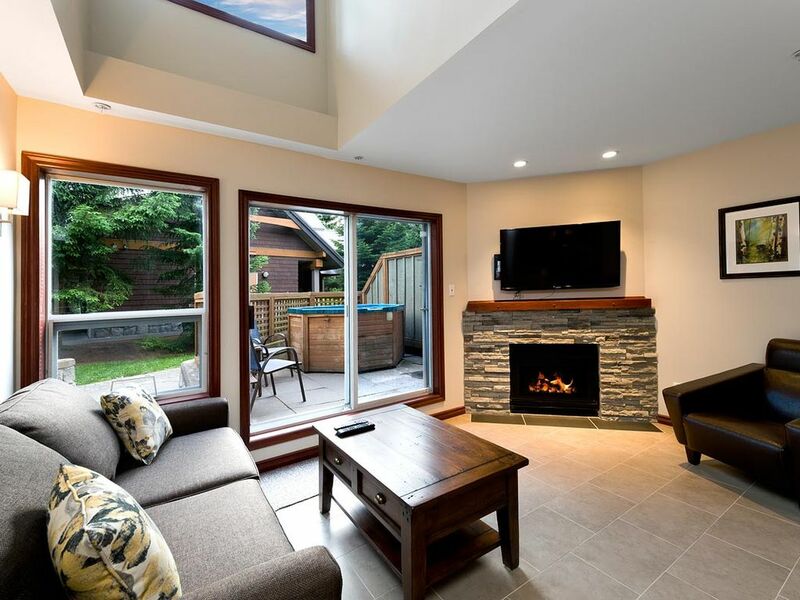 They are exceptionally clean, well maintained and fully equipped with Kitchen, Laundry, Internet, Private Hot Tub, Pool, Fireplace, Free Parking and a fantastic location in Whistler Village. We have over 2300 guest reviews and a 4.5 star average rating so give us a call toll free at for help planning your next Whistler Vacation. Relax in your own private hot tub located just off the living room. Soak up southern exposures with easy access to the shared pool. Kick back on a comfy couch after a great day of play. We hope that you enjoy all of the comforts and amenities of this fully equipped vacation home at Glaciers Reach. Our guests appreciate the convenience of staying across from the Whistler Market Place which boasts: liquor and grocery stores, Starbucks, restaurants and several shops. All of our homes at Glaciers Reach are a ten minute walk or a free shuttle ride to the base of Whistler and Blackcomb mountains. Everything that Whistler Village offers is at your door step, along the picturesque, cobble-stoned village stroll. Some of the recent upgrades to this two bedroom two bathroom townhome include: paint, carpet, mattresses, duvets and pull-out couch. Other features include a 46 inch Smart TV, CD player, TV in master bedroom, AC, gas fireplace, heated year round pool, shared sauna, free underground parking and high speed internet with Wi-Fi. This vacation home sleeps a maximum of six guests but four is recommended. The bedding consists of; a queen bed, two twin beds that can be joined to make a king upon request and a double sofa bed. All of our Whistler vacation rentals are professionally managed, well maintained and exceptionally clean. Let us help plan your next Whistler vacation! Small for 5 adults but clean, private hot tub, lots of towels and kitchen extras. All the appliances and media worked great. Condo was perfect for us 4 guys! Great location, easy to walk everywhere in the village. Very clean and ample space. We loved it here. 2nd time to stay with All Season Vacation Rentals. Facilities are clean, well stocked and comfortable. The location is great. Can walk across the street to market and Starbucks for morning coffee or to Tim Hortons for breakfast. For people with young kids, McDonald's is also across the street. Washer and dryer was nice plus the ACs in the bedroom were really appreciated. Housekeeper was very kind too. Showed us another unit in case we wanted to stay on 1st floor with no stairs for our next visit. We enjoyed this condo immensely! It was convenient to the village and had everything we needed! The management was friendly and responsive to all of our needs! Just what you need ! Came up to Whistler for Tough Mudder 2018, Our group has never been one for the nightlife in Whistler and if that's you also, this is the place for you! Space to cook your own meals, relax in your own hot tub and enjoy whistler without the noise/hussle of the village! Only issue was we had 6 adults, and it was a little tight for all of us but worked for our two night stay. We will be coming back! !